A moped license plate number is composed of two letters, followed by four numbers. Using this system (two letters followed by four numbers), how many license plates can be made without duplicating any numbers? Comments for Permutations or Combinations? 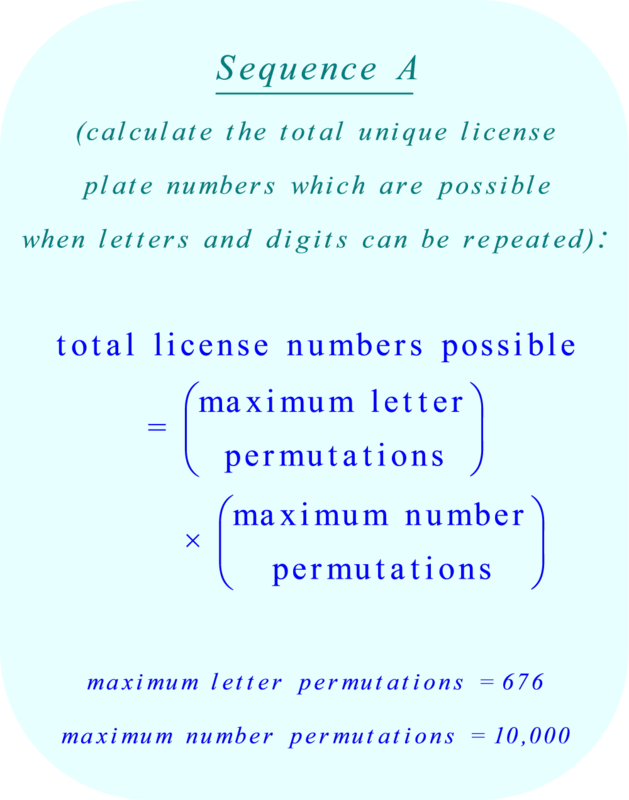 The maximum number of unique license plates which can be made by combining any two letters from the (26 character) English alphabet, followed by any four (1 digit) numbers can be calculated easily. 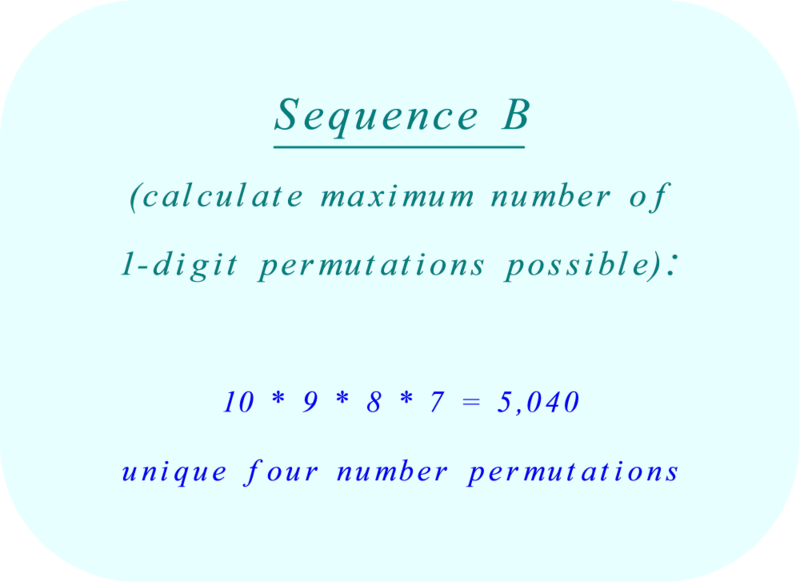 Since the order of the letters and numbers is important, we will be calculating the number of permutations possible (rather than the number of combinations possible). However, the problem statement does not specify how to take duplicate letters and duplicate digits into account. e.g. : The letter combinations AA, or BB, or CC, etc. for the first two letters of the license plate are valid. The letter combinations AC, or AD, or AE, etc. for the first two letters of the license plate are also valid. 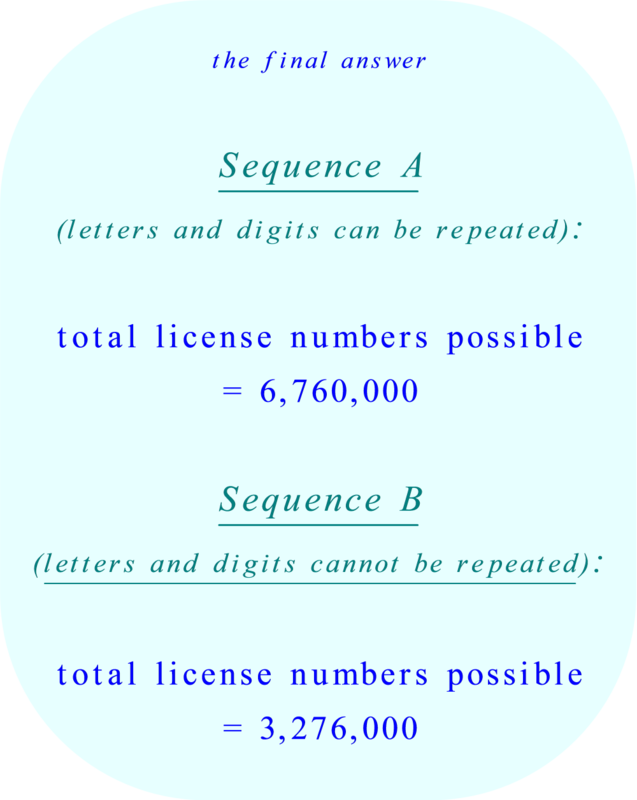 The 1 digit number combinations 4400 or 4444, or 9159, etc. for the last four letters of the license plate are valid. 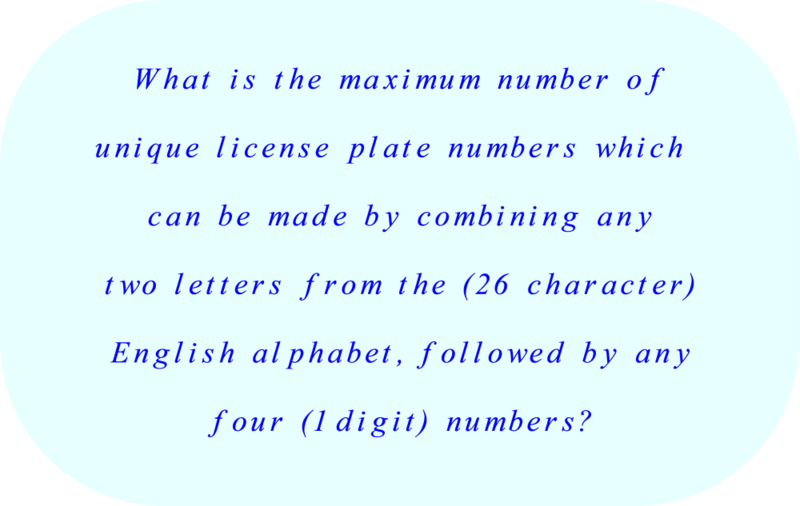 In addition, the problem statement makes it clear that every license plate number begins with two letters which are followed by four numbers. 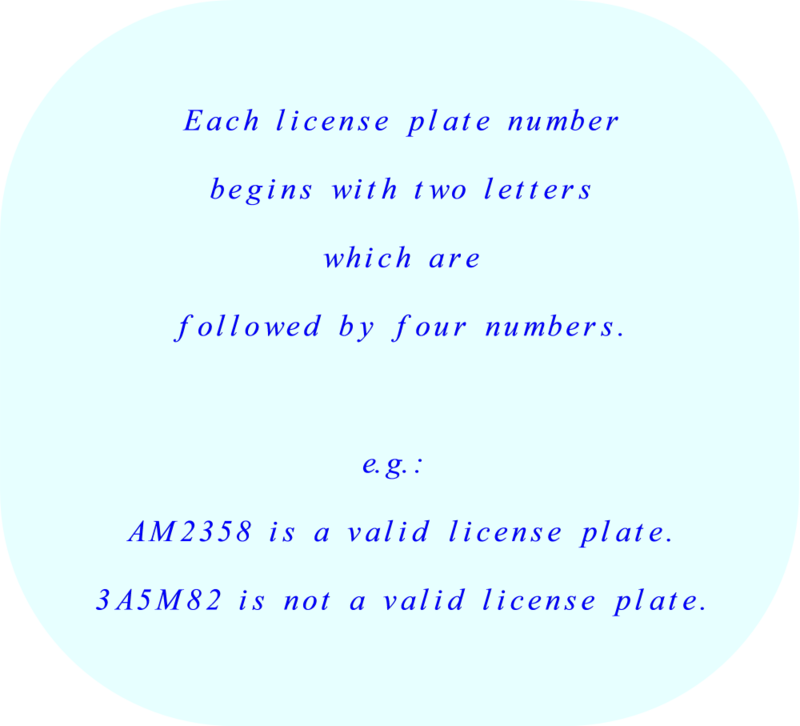 AM2358 is a valid license plate number. 3A5M82 is not a valid license plate number. 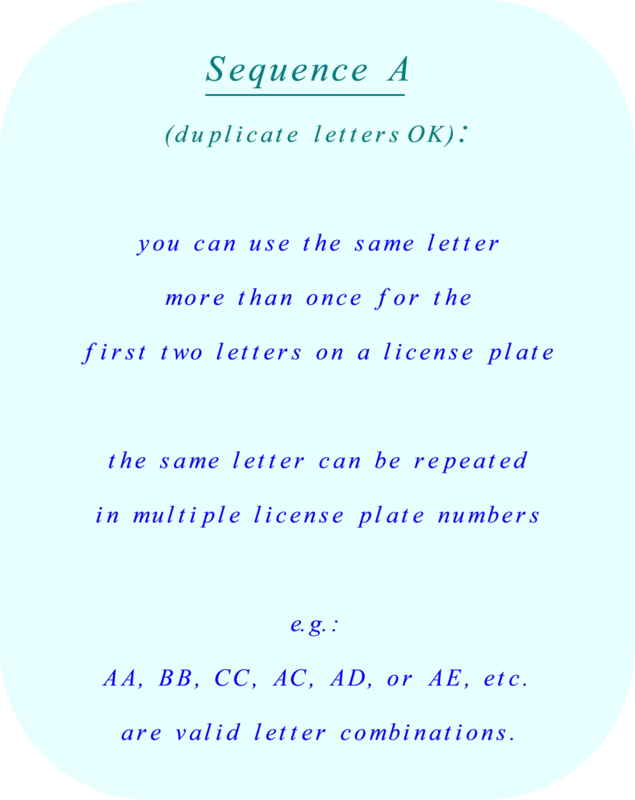 There are 676 unique, 2 letter sequences which can be used as the first two letters of the license plate. There are 26 letters in the alphabet. 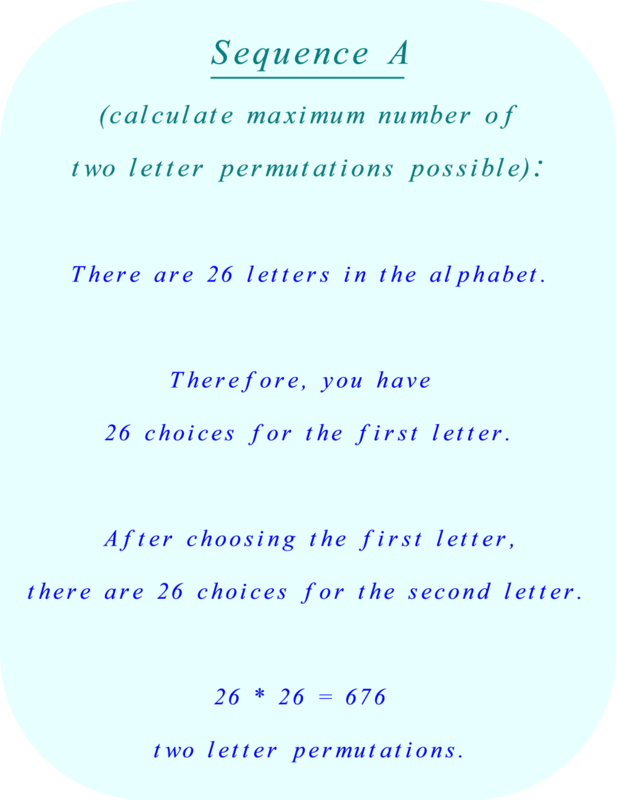 Therefore, you have 26 choices for the first letter. After choosing the first letter, there are 26 choices for the second letter. 26 * 26 = 676 unique two letter permutations. There are 10000 unique, 4 digit number permutations which can be used on the license plate. There are 10 single digit numbers: 0 , 1, 2, 3, 4, 5, 6, 7, 8, 9. Therefore, you have 10 choices for the first number. After choosing the first number, there are 10 choices for the second number, 10 choices for the third number, and 10 choices for the fourth number. 10 * 10 * 10 * 10 = 10000 unique four number permutations. There are 650 unique 2 letter combinations which can be used as the first two letters of the license plate. After choosing the first letter, there are 25 choices for the second letter (since the first letter cannot be repeated). 26 * 25 = 650 unique two letter combinations. permutations = n!/(n - r)! permutations = 26!/(26 - 2)! There are 5040 unique, 4 digit number combinations which can be used on the license plate. Since none of the numbers can be repeated, after choosing the first number, there are 9 choices for the second number, 8 choices for the third number, and 7 choices for the fourth number. 10 * 9 * 8 * 7 = 5040 unique four digit combinations. permutations = 10!/(10 - 4)!